The latest idea to emerge from Hawaii's pioneering alternative energy scene is Ocean Thermal Energy Conversion (OTEC), a process that produces electricity by using the temperature difference between the warm ocean surface waters of tropical areas and the much colder deep water below. It may sound strange at first, but this unusual path to collecting another kind of solar energy appears to work. Makai Ocean Engineering has constructed a 105-kilowatt test project at a cost of $5 million to prove the concept. It's paid for in part by the U.S. Navy's Office of Naval Research -- the Navy has a goal to get 50 percent of its shore-based energy from alternative sources within five years -- and the Hawaii Natural Energy Institute. How does it work? OTEC pumps warm surface water at a temperature of around 77°F to vaporize a fluid with a low-boiling point such as ammonia. That "steam" spins a turbine to generate electricity, and then cold water from down deep (about 41°F) is used to cool and condense the steam back into liquid form. Then the process begins again in a constant cycle. 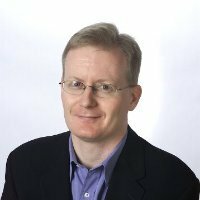 The wider the temperature differential, the more effective the system, and in this case, the spread isn't huge, which leads critics to point out the system's relatively low efficiency and question its economic feasibility. On the plus side, OTEC is easier and less risky than harnessing wave power, it's a 24/7 system that has no dependence on weather, and its outputs include fresh water through desalination and cooling through secondary use of the cold water. 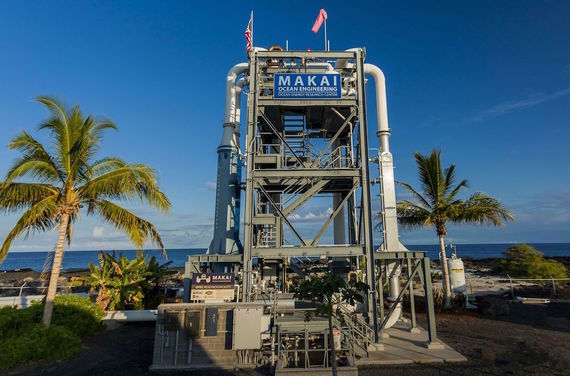 Though the test plant generates only enough power for 120 Hawaiian homes, Makai Ocean Engineering has made deals to develop a plant ten times more powerful in Japan and one 1,000 times more powerful in either Hawaii or Guam with the help of Lockheed Martin. Makai says that an offshore plant like that would produce enough power for 100,000 Hawaiian homes at 20 cents per kWh. Hawaii has a vested interest in OTEC's success: its goal is 100 percent renewable energy use by 2045. OTEC is clean and constant, requires almost no land, and according to one estimate could be sustainable at four or more times the planet's current total energy production. It sounds like a pretty good way to tap the solar energy collected by the ocean's surface, which you may as well think of as a really big solar panel.